What it is : A truly modern foundation that offers invisible, weightless coverage that looks like skin, not makeup (it's no wonder it's a bestseller). Who it's for : Normal to oily skin types, and anyone who wants a natural-looking finish plus hydrating, all-day wear. Why it's different : This long-wearing perfectly balanced formula evens skin tone, minimizes the appearance of pores, and conceals imperfections. Its hydrating technology leaves skin feeling cushioned, comfortable, and clean-skin looks like itself, only perfected. Explore the entire range of Foundation available on Nykaa. Shop more Bobbi Brown products here.You can browse through the complete world of Bobbi Brown Foundation. Alternatively, you can also find many more products from the Bobbi Brown Skin Foundation SPF 15 range. Explore the entire range of Foundation available on Nykaa. 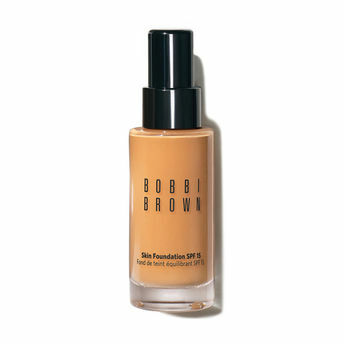 Shop more Bobbi Brown products here.You can browse through the complete world of Bobbi Brown Foundation .Alternatively, you can also find many more products from the Bobbi Brown Skin Foundation SPF 15 range.